By 8pm last night I had sworn off food forever. Our Thanksgiving meal was behind us and I'd eaten so much I decided I didn't want to see food again until at least Sunday. So what was I doing in the kitchen at 7am this morning? I was making what has since become known as Chris's Crappy Muffins. Last year we started a post Thanksgiving day breakfast tradition with our friends Haley and Chris and their family. They made breakfast and we brought over Lemon Ricotta Muffins. The muffins seemed to go over well with everyone last year so I decided to bring them again. It turns out that Chris loves the muffins so much he was telling people how crappy they were to stop the others from eating them. Needless to say his tactics did not work and all the muffins were gone by the end of breakfast. Sorry Chris no leftovers, you'll have to wait until next year or have us to breakfast sooner. Happy Thanksgiving! Lemon Ricotta Muffins a Giada De Laurentiis recipe 2 cups flour 1/2 tsp baking powder 1/2 tsp baking soda 1/2 tsp salt 1 cup sugar, plus more for sprinkling 1/2 cup unsalted butter 1 Tbs finely grated lemon zest 1 cup whole milk ricotta cheese 1 large egg 1 Tbs fresh lemon juice 1/2 tsp almond extract 1/3 cup thinly sliced almonds Line 12 muffin cups with paper liners. Preheat the oven to 350. Whisk the flour baking powder, baking soda, and salt in a medium bowl to blend. In a large bowl, using an electric mixer, beat 1 cup sugar, butter, and lemon zest until light and fluffy. Beat in the ricotta. Beat in the egg, lemon juice, and almond extract. Add the dry ingredients and stir just until blended. (batter will be thick) Divide the batter among the prepared muffin cups. 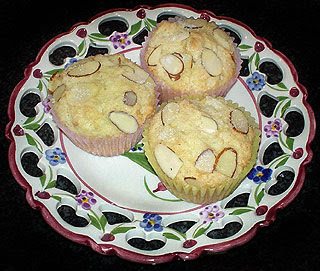 Sprinkle almonds and some sugar over the muffins. Bake until the muffins just become pale golden on top, about 20 minutes. Cool slightly. Serve warm or at room temperature.